The Bit Mining cloud mining service for LTC and BTC recently had some technical issues that caused about a day of downtime, but it seems that the website is now back online and working. We’ve been using the service for just a few days starting with the purchase of 100 KHS of Litecoin cloud mining hashrate and the earnings from mining that we get every 24 hours we are reinvesting into buying more KHS (the service even offers automation by setting a percent for reinvestment of earnings). At the moment there are still things that apparently haven’t been restored yet, for example the trading functionality of the website is not yet operational, and some users are reporting that they are not seeing the purchased hashrate. The support however reassures that everything will be restored back to normal soon as apparently they’ve had some serious problem. Meanwhile if you are having problems logging in, then try resetting your password and login with the new one. Another important thing that you should be aware of if you are interested in purchasing cloud mining hashrate at Bit Mining is that when you place a sell order of hashrate you have purchased it will not be mining for you ether until you cancel the order or you sell the hashrate. If you have used another alternative service for cloud mining scuh as CEX.io for example, you might expect that even the hashrate “locked” in trading is going to mine for you, but here apparently it does not. 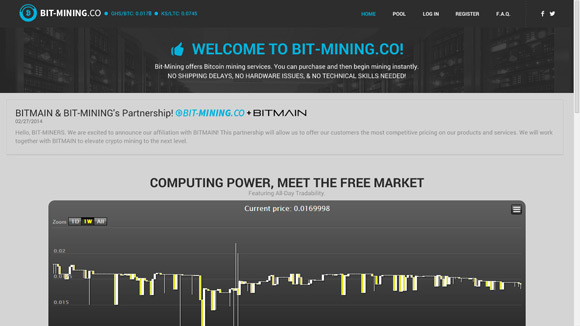 In our ongoing tests of the Bit Mining we have also decided to try to mine with local hashrate at the pools available. The good thing here is that you can not only cloud mine, but also mine with mining hardware that you own physically at the same terms (minus maintenance fee for non cloud hashrate). However either there were some problems with the pool or you need to mine for 24 hours (or at least to be still mining when the payout happens) in order to get your earnings. We have mined with a BTC ASIC for a few hours at the pool and it was reporting hashrate and expected earnings, but as soon as we’ve stopped the miners we got 0 for Daily Payout reported and when the actual daily payout happened we got nothing for the time we spent mining. Ths could’ve been a bug, or something that is not very well documented, but we do advice to test first yourself with some low hashrate, before leaving all your miners pointed at the Bit Mining pools. For now we are going to be focusing mostly on testing the cloud mining functionality of the service and we are going to report how things go as we continue using the service. Aside from the technical issues from the last 24 hours that Bit Mining is currently experiencing, the service worked pretty well for the few days we’ve been testing it. There were a few times when the website was loading a bit slower, but we were getting our payouts on time and had no issues in general aside from not getting anything from spending some time mining with an ASIC in their BTC pool. On the other hand the website’s interface and functionality could be improved as at the moment there are a few things that are not very user friendly, including the trading functionality. But we’ll see how things go from now on, at least the support is here and replying to users about their problems and it seems that issues are actually being worked on unlike in some other similar services. And we’ve had a fair share of issues with almost all cloud mining services that we’ve tried so far and the only one that seems to be holding up really well with no issues experienced for the last two weeks that we’ve been testing it is PBmining.